Do The New Instagram Web Profiles Mean Anything For Your Business? As many of you may know, Instagram launched their Web Profiles functionality on Monday, November 5. This is an important update, given Facebook’s acquisition of Instagram in April. As a self-described Instagram addict, I was excited that I could view my own photos on the web and also check out other people’s photos right from computer. 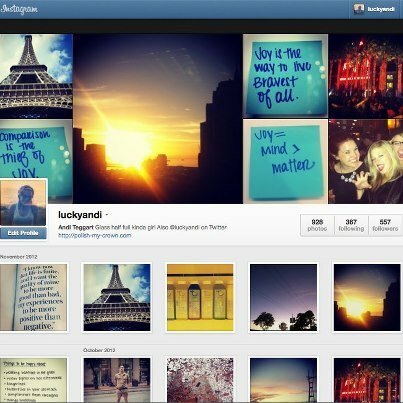 Instagram’s Web Profiles functionality launches after a huge peak in Instagram use during Hurrican Sandy. There were 800,000 Instagram photos tagged with the #Sandy hashtag and over 1.3 million photos documenting the hurricane on the East Coast last week. More and more people are using Instagram as a tool to share photos of their own life – but search for photos related to the topics they are interested in. Individuals aren’t the only ones documenting their personal life on Instagram; brands have jumped on the opportunity to connect with their audience on the visual platform. Brands like Red Bull, MTV, Puma and Warby Parker are just a few that are using the Instagram platform successfully. Instagram’s web profile allows you to view a user’s Instagram photos on the web – see a snapshot of Nike’s Instagram web profile below. Each Instagram web profile will feature a selection of a user’s most recent images above their profile photo and bio – similar to the Facebook cover photo. The Instagram web profile will also show profile information, including links included in the user’s Instagram bio and a grid of all Instagram photos below. Honestly, I think the layout and design is beautiful! I also really like that the cover photo isn’t static, but instead the photo collages rotates your recent images without you having to refresh the page. Looking for your individual or brand web profile? Simply visit http://instagram.com/[username]. What does this mean for individuals and brands? This is important because previously, people needed an outside platform to view Instagram photos, like Statigram or Webstagram. While this feature is exciting for all Instagram users, it’s especially important for brands on Instagram. Web profiles will allow brands to seamlessly connect their mobile and web experience by offering the community an online destination to showcase Instagram content. Brands are able to direct their audience to their web profile allowing their larger community to view their photos all in one place. The web profile functionality is also a great way for brands to build awareness of their Instagram account and grow their following. For community managers, Instagram web profiles will make your job a lot easier! You’ll be able to manage your Instagram communities right from your computer, including following users and adding comments and likes to photos. Rather than using a mobile device (and racking up mobile data), you can connect and engage with your community more easily and efficiently. 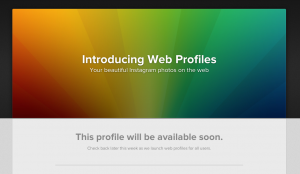 Instagram web profiles will be rolling out to all users in the next week or so. If you don’t see your individual or brand Instagram web profile yet, keep checking back at the Instagram site. I was pretty pumped to see mine go live last night though – see below! Instagram photo uploads will still take place natively within the Instagram mobile iPhone and Android apps.